(Phys.org)—A group calling itself Impactstory, a nonprofit team whose mission is to make science more accessible to everyone, has released a free Chrome/Firefox extension called Unpaywall that allows users to access some research papers that lie behind a paywall without having to pay to access the paywall site. The official release date was April 4, but users have been able to download and use it for several weeks. A paywall, of course, blocks unpaid access to articles published by a website. Those who do not pay can generally read an abstract but not the full text. Researchers are eager to have their work published on such journal sites, because publication offers prestige and some degree of assurance to readers that the work has been peer reviewed. But because of the way research papers are written, they quite often wind up on the internet where they can be read for free before they are accepted by one of the established journals. 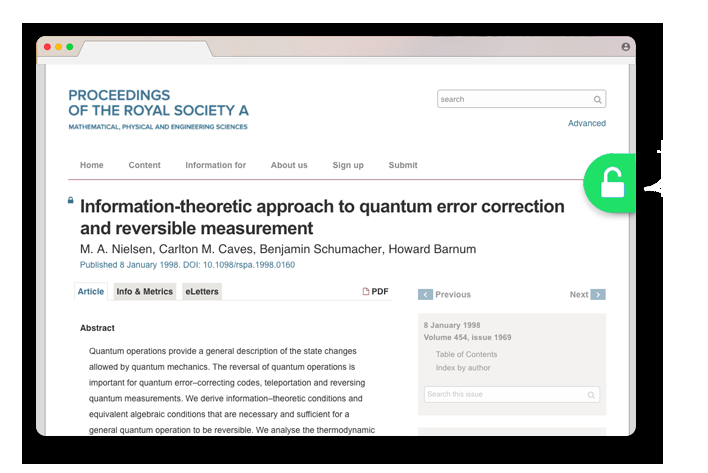 The prepress site arXiv, run by Cornell University Library, for example, allows researchers to post their work for review by others before they submit to a journal. Many people who wish to access papers behind paywalls have discovered that they can often find them for free elsewhere, but it takes a lot of work. That is where Unpaywall comes in—it does the work for you. Users who download and install the Unpaywall extension find that a grey or green tab appears on their browser when they visit a paywall site—a grey tab means the extension was unable to find a free version, while a green one means that it has found one. Users click on the "unlock" sign to access it. Unpaywall does its work by accessing a database of what are known as digital object identifiers (DOIs). Jason Priem and Heather Piwowar, co-founders of Impactstory, created the basis of the extension by developing an API called oaDOI to search for relevant DOIs. They claim that their extension is able to find a free version of a paywalled paper approximately 30 percent of the time. Many people who wish to access papers behind paywalls have discovered that they can often find them for free elsewhere, but it takes a lot of work. I have found that it doesn't take a lot of work. Google works pretty fast. And I think I have had at least a 30% success rate--maybe better than this software. Thanks, Google. Hm...I'll definitely give this extension a whirl. Note that the article on arxiv etc. are always slightly different than the ones published in the journals (for legal reasons). In almost all cases this doesn't make any difference content-wise, but one should be aware of this. You can achieve the same results often just by using the "select an element to hide" option, which is an addition to Adblock Plus. I get into the Forbes site that way.